Shibulata is a Kogi Mama: an enlightened leader of one of the world’s last, lost tribes. In 2008, he and other members of the 18,000 Kogi people living in the remote Sierra Nevada de Santa Marta mountains of Colombia, came out of centuries of fiercely defended isolation — for only the second time in their existence. They refer to themselves as the ‘elder brothers’ of humanity, the guardians of the Earth, and wanted to send us, their ‘younger brothers’ a message. That message is captured in Aluna – a groundbreaking documentary premiering at Raindance Film Festival in London this September. But the story begins much earlier. In 1988, Alan Ereira, a filmmaker for the BBC, was in Colombia tracking down a lost city, deep in the jungle, when he learned of a nearby tribe who had existed in almost complete isolation for at least the last 500 years. In fact, the Kogi are thought to be the only civilization to have survived culturally intact since the time of the Incas and Aztecs. They have no wheel, no written word, no language any outsider can speak, but possess a wealth of indigenous knowledge lost from the modern world entirely. Entering Kogi lands is no easy feat. Surrounded on all sides by almost impassable jungle and the terrors of armed guerillas, tomb robbers and cocaine traffickers, the Kogi have remained isolated precisely because it is almost impossible to reach them. When Alan finally arrived at the prescribed place – a small mountain village of circular thatch homes and terraced farmlands – he was placed before a council of Kogi Mamas. “I felt completely transparent to them,” he says, “as if they knew my thoughts just by looking at me.” He told them how a camera works, the Mamas deliberated, and by the morning he had a commission. That film, From the Heart of the World: the Elder Brother’s Warning, was released in 1990. In it, the Kogi warn humanity that we are damaging the Earth, and dramatically predict the end of the world if we do not change our ways. The film became one of the most profound documentaries ever made about an indigenous people. And the Kogi, satisfied that their message was delivered, returned to their mountain and asked never to be contacted again. But we did not listen. In 2008 Alan received a message, asking him to return to the Kogi village. They wanted to know why their warning wasn’t heeded, why we kept damaging the Earth. They wanted to try to communicate again with us, but this time – realizing that we understand more with our eyes than our ears – they promised to show us the evidence behind their message and take us on a journey that would alter our very understanding of reality itself. The resulting film is a beautifully shot, and poignant, revelation of one of the world’s last uncorrupted indigenous civilizations. But what makes the film so special is that it isn’t a documentary about the Kogi; it’s a documentary by the Kogi about us. We follow Mama Shibulata, his daughter Francesca, and other Kogi Mamas from his and neighboring tribes as they physically lay a nearly 250 mile line of golden thread between important ecological sites near their mountain home – the tallest coastal peak in the world, filled with layers of distinct climatic ecosystems and recognized, because of that, as a microcosm for the planet as a whole. As we follow their journey, we encoun-ter dried up river estuaries, polluted beaches, and disappearing forests – a landscape utterly de-vastated by industry. But the Kogi are not just highlighting the damage we’ve done, they’re trying to show us the delicate interconnections between the natural world: how what happens in one place has a consequence on what happens in another. The Kogi want to show us that the golden thread is real. The Kogi have a profound ecological knowledge and this is attested to throughout the film by conservationists, environmental scientists and even one, astounded astronomer. Nonetheless, there are occasions when their warning appears to be based in something more closely resembling belief, than hard fact. That they can divine the future by reading bubbles from water is something most viewers will find hard to accept. However, to let our different systems of knowledge and communication dilute their message would be to miss the larger point. For woven between the symbolism of their language, another, more profound message is embedded. The Kogi don’t want to just show us how we’re damaging the planet, they want to change the way we think about the planet entirely. They want to show us Aluna. Shibulata, like all Mamas, spent his entire youth mastering a unique form of concentrated thought that the Kogi believe connects them to a kind of cosmic consciousness that underpins the material world and is the basis of reality itself. This is Aluna or The Great Mother. For the Kogi, the planet is embedded in pure thought; we exist in a conscious universe. Through this connection, the Kogi believe they are able to commune with the planet as a living entity, enabling them to protect its natural balance, and all living beings within it. This metaphysical plane, they believe, intersects with the physical world along identifiable geographic lines that are spread out across the Earth. The Kogi want to show us the blood and breath of a thinking, feeling Earth. 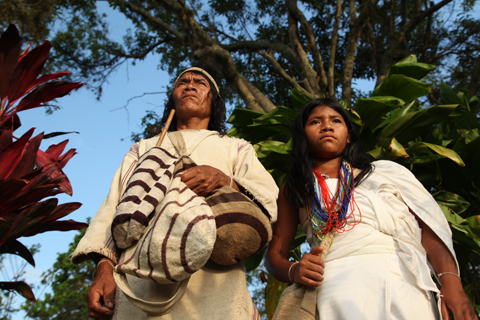 Another of the project’s goals is for the modern world to utilize indigenous knowledge more effectively. “The Kogi have offered to work with scientists to help protect the Earth,” Alan says. Indeed, Professor Jonathan Baillie of the Zoological Society of London has expressed interest in the Kogi helping him to locate key refuge areas of certain species – places that they return to in times of ecological disaster, which must be preserved in order to protect against that species’ extinction. Mama Shibulata and his tribe have now returned to their mountain. And despite all the challenges humanity faces, they still have hope. “You do not need to abandon your lives,” they tell us at the end of the film. Perhaps instead, at least to begin with, what we need to do is change the way we understand the Earth: from a collection of disparate habitats to a complex of interdependent systems, from an inanimate object to a living, intelligent entity. Perhaps then we, the younger siblings, will finally grow up.